One of my favourite things about Metroid Prime is how three particular moments define my personal experience with the game, and demonstrate why I believe the game went on to become so revered. These moments are small in comparison to the majority of the game, but they stand out because of their clever use of subtlety and implied storytelling; their demonstration of just how successful the transition from 2D to 3D actually was; and because of the way in which they compel you to keep on playing through the allure of exploration and discovery. They represent my fondest memories from the game and below I detail why. As you may have gathered from my previous post, I found the opening segment of Metroid Prime to be quite amazing -- not necessarily for what it does or what it shows (though that is impressive), but because of how quickly it put you into its unique take on the Metroid universe, and how suddenly it allowed you to assume the role of Samus Aran. Practically immediately you enter that first-person perspective and see the world how she sees it, and this small but significant fact is why I think the game begins so well: it doesn’t waste time with exposition or trying to set up the differences between a 3D Metroid and the prior 2D ones but, rather, it puts you in Samus’ shoes so she (and therefore you) can resume her adventure. After all, this is Samus Aran: she doesn’t have the time to waste on easing players into her life or explaining why things continue to go awry; she’s on a mission to do her job as a bounty hunter and it’s up to us to engage with that fact, not the other way around. The whole reason she’s even on Orpheon to begin with is to investigate a distress call, not walk us through some tutorials and demonstrate how the rest of the game will play. But that’s the beauty of this entire level, too: it does teach us how to play in what is, essentially, intuitively designed tutorials, but we wouldn’t ever know it because as soon as we gain control, we have inhabited the role of Samus Aran. Right from the get go we can move our (emphasis required -- Metroid Prime is a shared experience between Samus and the player) visor around to survey our surroundings, our reward for doing so being the large and beautiful Tallon IV that looms in the distance; a nice close-up of Samus’ gunship if we turn around; and asteroids gently hovering past just begging to be used as target practice. A quick couple of shots from the beam cannon reveals the level of detail we can soon expect to be the norm as they break apart, how efficiently our shots can dispatch whatever we line up in our sights, and how pleasing and simple it is to use our primary weapon. Switch over to the scan visor and we notice the distinct red and orange of objects that can be scanned, the boldness of the former suggesting important points of interest whilst the latter gives us information that might be relevant to our interests and/or objective. 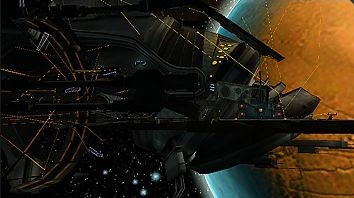 Like shooting, scanning is also basic and accessible, and it isn’t long before the force field gates standing in our way -- the first, proper hint at a tutorial -- are dealt with, allowing passage to the only door that provides entrance into the frigate. Space frigate Orpheon with Tallon IV looming in the background. All of these things are incredibly small compared to the rest of the game and, indeed, even the opening level -- we haven’t even gotten inside Orpheon, after all -- but they’re significant because of what they do to begin the experience. Straight away we learn about our main methods of engaging with the game, through clever but minor obstacles and subtle cues that entice rather than enforce, and almost instantly we are eased into the adventures ahead and our role as Samus Aran. But while these aspects of the opening segment are for the player’s benefit, we also see Samus approaching these unknown surroundings in the only way that she can: agility and acrobatics as she jumps from her ship and lands on the Orpheon; instant investigation as she scans her environment and starts to discover what is going on; and confidence as she moves past those simple gates, shoots a few asteroids and enters the frigate. She may be alone for most of her journey but within seconds of arriving she has already displayed why she is so effective at her job, and why she has as much respect as she does: put simply, she gets the job done, but does so in a way where she’s the most informed and where she can have the best approach -- nothing more, nothing less. Changing pace from the impressive beginning of the game, landing on Tallon IV for the first time stands out for its beauty, as well as the way in which it sets the tone of the adventure. 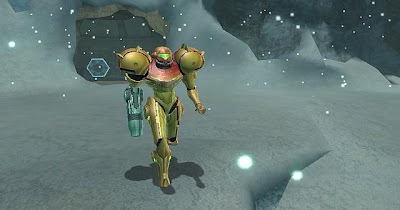 Metroid Prime is organic, its environments coming across as alien but entirely natural at the same time, and our first visit to the Overworld is, perhaps, the best example of this. Flora dominates the landscape, the Red Starburst and Glowing Spidervine capturing particular attention thanks to their bright and (in the case of the Spidervine) luminescent appearance. There’s also a quaint waterfall and small pond in the vicinity, the latter of which is lined with another type of plant unique to the planet: the Tallon Fern. 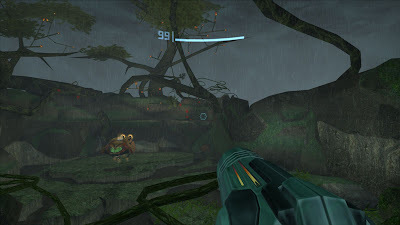 Combine such gorgeous foliage with the rain that saturates the landscape and beads down the sides of Samus’ beam cannon, and you have an arresting environment that is absolutely foreign and yet, at the same time, totally comforting to us (both as players and as Samus), too, given how natural it all looks. 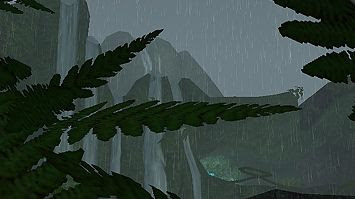 It looks like a wet jungle, feels like a rainforest and lends the game an atmosphere that is not only completely different to what was found on the Orpheon, but is much more relaxing and utterly awe-inspiring. In some ways, it’s even a poignant moment: a chance to catch a breath, take in the view, and contemplate before continuing the adventure -- how many other games offer such opportunities (and so early, too) to their players? Tallon Ferns in front of a very prominent waterfall. The wonderful thing about this particular moment, however, is how captivating it is upon reflection. It might be engrossing each and every time you experience it, but even more beautiful is how it stands out in the memory and defines your connection to the game. Its organic nature and relaxed atmosphere correlates with some of Metroid Prime’s core qualities: the ability to inhabit and explore new environments, and to do so at our own pace, not a predetermined one. Its immersion at its finest, then, and something that only increases as you progress and discover the intriguing fauna of the Tallon IV Overworld region, and what they add (and mean) to the planet. 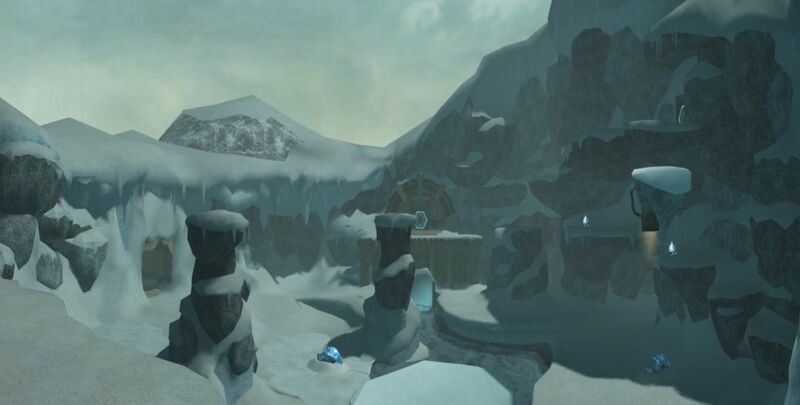 No post about Metroid Prime’s most significant moments would be complete without a mention of the Phendrana Drifts and, in particular, the first time you get to see them. Many players highlight this moment as one of those true ‘gaming moments’ that seldom appear but always resonate, and I’m not one to disagree: it is one incredible moment -- most certainly my favourite -- and it stands out because of how perfect it really is. Everything about entering the Phendrana Drifts region for the first time is amazing, because of how cohesive it all is. The beautiful snow glistens under the sunlight whilst those gentle piano keys of the level’s wonderful theme tune begin to play. The camera slowly pans out away from Samus to reveal a relatively large room, full of new things to see. Obviously, a snowy area is a complete change from all of the levels that had been experienced thus far -- especially the fiery depths of Magmoor Caverns -- but, more than that, what is visible in these initial moments goes a long way in setting up the region as a whole. Standing tall in front of us are some rocky pillars, a small river winding through them. Atop a cliff reside some destroyed buildings, clearly of Chozo origin considering we have already visited the Chozo Ruins and learned that they once inhabited Tallon IV. Scattering about in the sky, hastily, are some bird-like creatures, whilst over on some ledges we can see some small life-forms crawling about -- new species that we haven’t seen before, and which continue to define and add personality to the planet as a whole. An icy lake also exists here, small fish scurrying around proving to be yet another example of the level of detail that can be found in the game. Screens don't do it justice; this place is stunning. 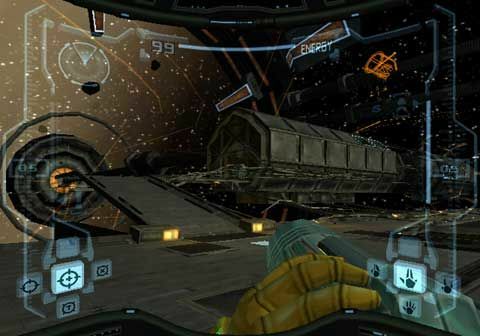 By now we’re fairly experienced with playing Metroid Prime and certainly familiar with how to advance, what our objectives are, and how to approach whatever lies before us. This means that the Phendrana ‘moment’ doesn’t last long as we are quick to resume our adventure, but even so that doesn’t take away from its incredible impact -- it is this moment that defines the entire game, for me, and exemplifies why Metroid Prime as a whole is so remarkable and unique: it’s atmospheric thanks to the strong cohesion visually and aurally; it instills a sense of loneliness and even mild melancholy because of the minimal life, ruined structures and subdued tone; and despite the moment stopping us in our tracks, momentarily, it becomes nothing more than a memory as we quickly continue on our journey. Metroid Prime as a game is renowned for its atmosphere, isolation and discipline, and despite being quite a breathtaking, mesmerizing scene, we soon ignore the beauty to focus on the task at hand. Like a holiday snap on vacation it recalls a moment in time that was delightful, but as soon as you look away the impact is gone and things return to normal. Proof, then, that small things can be just as important as their larger counterparts, if not more so, and that the execution of a moment requires incredible attention to detail. Speaking of which, detail is the subject of my next post, with specific emphasis on the little things that make this game such a delight to play. "The whole reason she’s even on Orpheon to begin with is to investigate a distress call, not walk us through some tutorials and demonstrate how the rest of the game will play." "not only completely different to what was found on the Orpheon, but is much more relaxing and utterly awe-inspiring. In some ways, it’s even a poignant moment: a chance to catch a breath, take in the view, and contemplate before continuing the adventure "
Yes. Yes! I don't have anything to add to this, I think you did an awesome job bringing out what's so awesome about MP. Zach -- Heh, I'm glad you liked it. I wasn't trying to specifically pinpoint why the game is such a masterpiece as these are just what I thought were its defining moments, but at the same time I have no doubt that my experience would be very similar to many others', so it's good to give these moments some recognition for what they do to (and for) the game. Very well-written article(s). Metroid Prime is indeed a great game. Wikzo -- Again, thank you very much. It means a lot to me when people read my work, let alone think it's worthy of sharing around. It's very much appreciated. Back in 2002 I owned an XBox and had been playing Halo and whatever else was on the XBox at the time. But I remember renting a gamecube specifically for MP, and was blown away by the graphics and gameplay. The whole thing felt like it was from five years in the future. I was brought here by the link on Critical Distance. Great piece discussing one of gaming oft-remembered but seldom analyzed gems. You picked up on 3 of my favorite memories from MP perfectly. As a lore-fanatic, I'd have to add seeing the Chozo Ruins for the first time as another "moment" from the game that has stuck with me since my initial playthrough. To see the mysterious home of the bird-men from Super Metroid laid out before me was truly exciting. It manages to expand the Metroid fan's understanding of the ancient race, but deepen the mysticism surrounding their culture. Michael -- Interesting, I had a similar experience playing Halo: Combat Evolved. I think both were ahead of their time, really, and I also distinctly remember being more excited for their sequels than the other big game to come out at the same time in 2004: GTA: San Andreas. Having said that, Metroid Prime influenced me a lot more than Bungie's masterpiece and ensured that I went on to become a fanboy of the entire Metroid franchise. I'm nowhere near being a massive fanboy of Halo, but I can and will always respect what that franchise has done for the medium. Unknown -- Unfortunately I didn't get to have the 'Chozo moment' because, aside from Metroid Fusion on the GBA Metroid Prime was my first ever game in the series. However, despite not having the background you clearly did, I still found the ruins to be fascinating because of the mysticism that the ancient race had(and has), and because, I guess, I always love discovering and learning about new species and creatures (and etc.) in games as a whole. The kind of depth found in Metroid Prime with the Chozo species (and even the Space Pirates, it has to be said) was unlike anything else I had played before (and, indeed, few games have it these days too) so, naturally, I was in awe as I continued to progress. Having said that, I understood just how effective the Chozo Ruins were on subsequent playthroughs once I had played Super Metroid, and had a deeper knowledge and understanding of the franchise as a whole. To say it was clever would be an understatement; to know that it was all done so effortlessly, elegantly and subtly is just mindblowing.